In a series of blog articles I will show how you can instrument your ADF Application key actions. Instrumenting gives visibility and insight of what is happening inside the ADF application and in the ADF framework (what methods and queries are executed, when and how often). These runtime diagnostics can be very effective in identifying and solving performance issues. This enables developers to diagnose and solve performance problems at an early stage and to build an efficient, responsive ADF application before it goes into production. 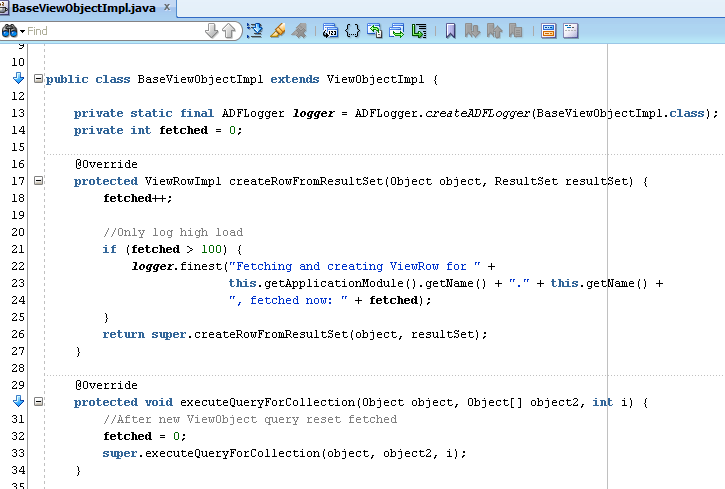 In this blog, part one, I will discuss instrumenting the ADF BC ViewObject. In part 2 the ApplicationModuleImpl is discussed. You can measure exactly – like a stopwatch – the execution time of a Java method by retrieving the current nano time just before and immediately after the method execution by calling System.nanoTime(). System.currentTimeMillis() can be a few milliseconds inaccurate. See the API doc of System.nanoTime() and System.currentTimeMillis(). You can look at the ViewObjectImpl API doc for important methods to monitor. A quick and simple way to monitor executed database queries in ADF is to override the ViewObject method executeQueryForCollection() in your metrics base class. In this way you can monitor which ViewObject queries are executed, their execution time, when and how often. You might detect redundant or unexpected ViewObject queries. With this method you can monitor all queries including queries from ViewAccessors, programmatic ViewObjects, detail queries from ViewLinks, e.g. ). The metrics are collected in a separate object called MetricsVoExecution. Extra runtime metrics are collected like bind variable name and values, ViewObject definition name, fetched rows, e.g. to make the metrics even more useful. The execution time is measured in the superclass call super(). You might want to look at the ViewObject API to override other interesting methods as well. You can consider to only log metrics when the execution time passes a configurable threshold. In my previous blog about detecting a high ADF BC memory consumption I explained how you can instrument and measure how many rows are fetched from the database, and how many ViewObject rows are created and cached. The most important method to override is createRowFromResultSet() and counting them in the MetricsViewObjectImpl or BaseViewObjectImpl. Reset the counter before a query is executed (again). 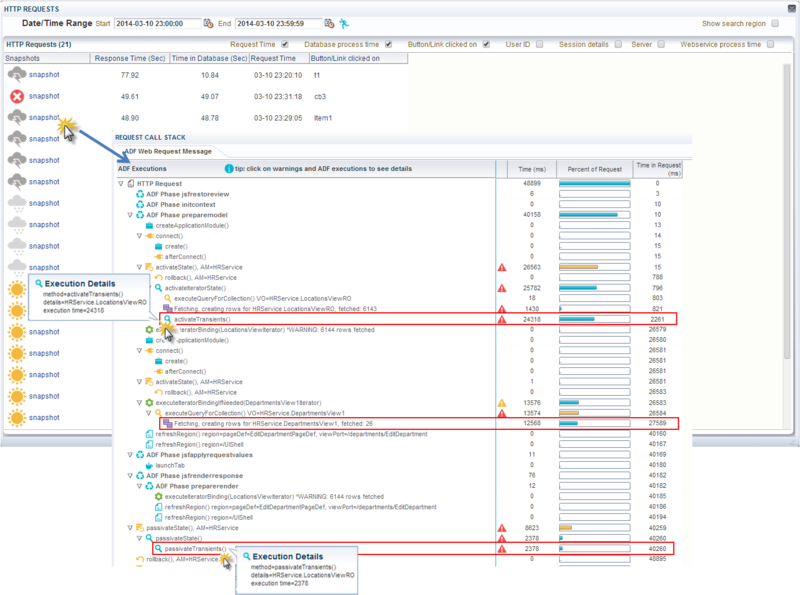 In test and production environments, the ADF request call stacks of the ADF Performance Monitor provides similar functionality as the runtime diagnostics of the Oracle ODL Analyzer (by ADF request). 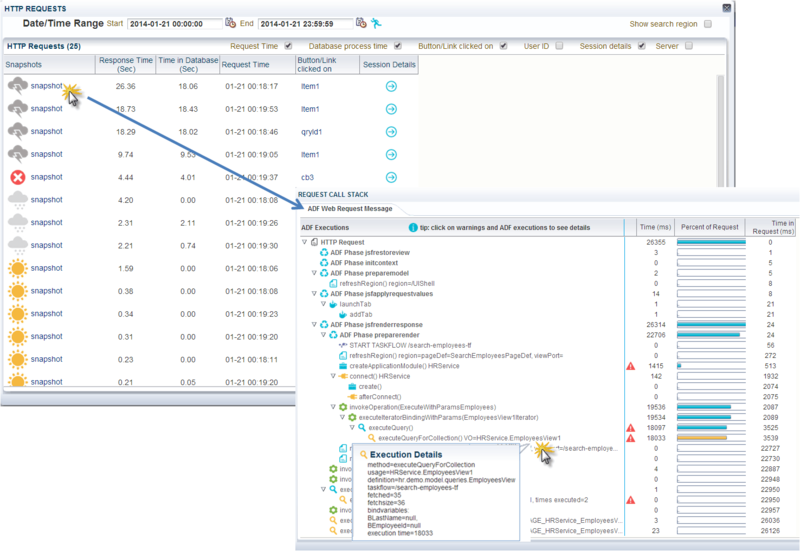 The Oracle ODL Analyzer can be useful in the development stage, but can’t be used in test en product environments because of the amount of logging generated and the significant performance overhead. The ADF Performance Monitor records the performance with a very low overhead (less than 2%, caused by the detailed collection of performance metrics).